The Burmese Python population has expanded throughout South Florida as the result of the illicit pet trade and snakes being released into Florida’s wetlands by owners who no longer want them. Photo courtesy of the National Wildlife Federation and the South Florida Water Management District. The invasive Burmese Python population in the Everglades has become a large-scale issue for Florida’s native wildlife. The Burmese Python can grow up to 23 feet in length and weigh as much as 200 pounds. According to the Florida Museum, these invasive predators are targeting several native, threatened, and endangered species, thus further complicating their chances of recovery. Carla Dove, Head of the National Museum of Natural History’s Feather Identification Lab, has partnered with the Everglades National Park in combating the overwhelming python population. Dove is a skilled Ornithologist, a scientist who specializes in birds, and has taken on the task of identifying bird species found in the stomachs of pythons captured in the Everglades. To date, Dove has identified more than thirty different species of fowl, including the wood stork, limpkin, and the great blue heron. The loss of endangered species to predation is a natural occurrence; however, the rate and aggression at which the Burmese Python kills is adversely affecting Florida’s habitat. 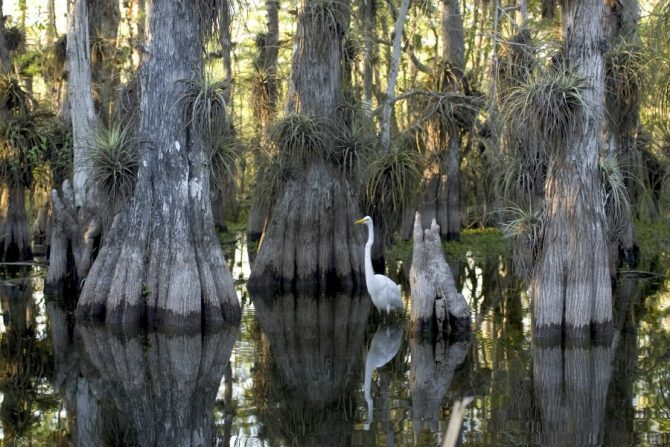 A great egret wading in the Everglades National Park. Photo by Rodney Cammauf, courtesy of Nation Wildlife Federation. Dove’s findings correlate with those of the National Park Service, which reports a dramatic drop in several other animal populations that live in the Everglades. According to the National Park Service, rabbits, alligators, bobcats, and adult deer have fallen prey to the Burmese Python. To gauge the true nature of the problem, researchers with the U.S. Geological Survey and the University of Florida radio-tracked ninety-five marsh rabbits from 2012-2013. By the end of the study, nearly 80 percent of the rabbits were found inside the bellies of Burmese Pythons. Another grim sign of the area’s python crisis is the lack of nocturnal animal activity on the roads. Researchers working within the Everglades conducted a study of the nighttime activity along the roadways from 2003-2011. The study showed a decrease of raccoon sightings by 99.3 percent, opossums by 98.9 percent, and bobcats by 87.5 percent. Another concerning finding was the complete absence of rabbit activity along the roadways. The National Park Service estimates that the Burmese Python population, within the Everglades, has grown to over 100,000 strong. Further complicating the situation is the snake’s ability to lay 35-100 eggs annually. Based on these findings, many believe that the Burmese Python is a permanent resident of the Sunshine State. Measures have been taken to cull the creature in hopes that Florida’s delicate ecosystem could be restored to its original state; however, to date, all attempts have failed. Florida wildlife conservationists continue to fight to minimize the effects of the invasive species and to impede the Burmese Python’s migration further north into the state. The task has proven challenging, as Burmese Pythons have already been found in small numbers in the Keys and in northern counties. The Burmese Python could travel as far north as South Carolina, according to researcher Michael Dorcas of Davidson College. Hunter catching a Burmese python in Davie, Florida at a Python Patrol training. Photo taken by Liz Barraco, courtesy of Florida Fish and Wildlife Conservation Commission. If the Burmese Python population continues to expand, it will undoubtedly cause never-before-seen damage to Florida’s delicate ecological habitat. 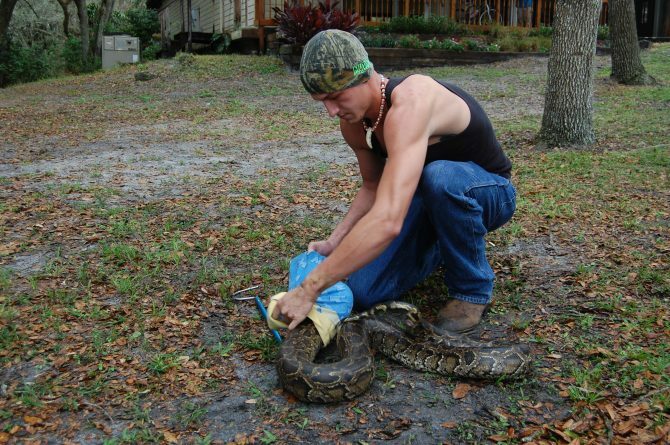 In efforts to release the Burmese Python’s grip on Florida’s landscape, the Florida Wildlife Commission (FWC) has issued temporary permits to snake hunters. As an added incentive, the FWC also offers cash prizes to encourage participation. For more information on python hunting, visit the Florida Fish and Wildlife Conservation Commission’s Python Patrol. For those less adventurous types, donations can be made to Nature Conservancy or by reporting invasive species sightings at I’ve Got 1.